Kids get to cut, glue, and color with this my five senses worksheet! Cut out the names of the senses, match them to the objects that represent that sense, and glue them down. And of course, color. 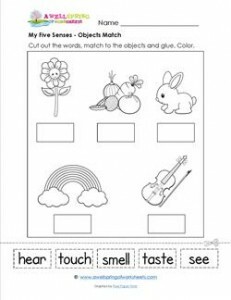 Please go to this page to see all the my five senses matching worksheets.